The Heritage Line operates two traditional-style, luxurious, boutique junks in Vietnam's Halong Bay. Known as "The Sisters," these distinctive vessels offer outstanding levels of service with 16 crew members looking after 12 passengers. The ships were inspired by the names of local flowers and Violet is the younger sibling of Jasmine. With six cabins, the small ship provides passengers with a very exclusive and close-up experience in Halong Bay, where the boat's red sails are dwarfed by the bay's towering limestone islands. Built to resemble a traditional Asian junk, the charming wood-clad Violet features gleaming floors, rich silk and velvet furnishings, and cabins with floor-to-ceiling windows to make the most of the passing views. Despite its small size, the ship has an impressive range of amenities including a gym, sauna and spa. Violet has two Junior Suites that are located on the Main Deck and measure 387 square feet in total, with a 64-square-foot balcony. Named Water and Mountain after the elements of Halong Bay, they are both individually designed. The Water Suite has a soft, white color scheme with a king-sized bed. The Mountain Suite is decorated in yellow tones and has twin beds. They both have marble bathrooms with a walk-in shower and whirlpool and amenities include a mini-bar, tea and coffee making facilities, robes, hair dryer, flat-screen TV and DVD player. The four Imperial Suites -- called Dragon, Phoenix, Moon and Cloud -- are all located on the Upper Deck. They are all double cabins, apart from Cloud that can be configured as a twin. They all measure 409 square feet, including 53-square-foot balconies. As with the Junior Suites, all four are appointed with a retro Indochina-style decor. The Phoenix and Dragon are decorated in red colors with gold or silver fabrics. The Cloud and the Moon have a lighter white and blue color palette. All have king-sized solid wood beds, dark furniture, charming fabrics and decorative walls and ceilings paintings. In the dining room the menu specializes in seafood, although other regional and international cuisine is on offer. There is also a cozy bar. The small spa has room for one passenger at a time and offers a varied selection of relaxing treatments. Violet also has its own gym and a sauna, the latter with room for two passengers. The Sun Deck has plenty of loungers and is also used for dinners under the stars. There is also a small day bar with wooden chairs and cushions. Cruises feature tai chi classes on the Sun Deck, talks and presentations on local culture, a Vietnamese cooking workshop and a bamboo rowboat trip to a fishing village. Fares include all meals, excursions with English-speaking guides, local transfers and bottled water in the cabin. 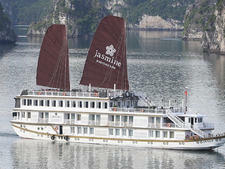 Violet sails two itineraries: the one-night "Dragon Passage" and two-night "Jewels of Halong Bay." 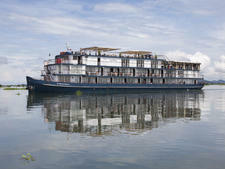 Small river vessel on the Mekong has high-end amenities, including pool and spa. 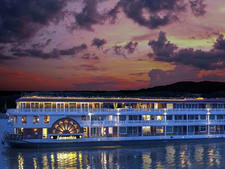 Mekong riverboat has spa, fitness center and steam room, as well as colonial décor. 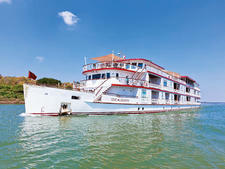 Replica British-colonial paddle steamer in Myanmar (Burma) boasts pool, spa, sauna and gym.